“Human rights” is a broad term for those rights that we are all entitled to simply because we are human (e.g. freedom from slavery and torture, equality before the law, right to food and shelter). These rights support decency and dignity for all. Sometimes these rights are protected by specific laws, for example, anti-discrimination laws. In a democracy, we also have civil rights, sometimes called civil liberties, which can be understood as protecting individuals from the government. These include freedom of association, freedom of assembly, freedom of religion, and freedom of speech. In Canada, one of the protections of our civil rights is the Canadian Charter of Rights and Freedoms, which is part of our constitution. Together with these rights, we have responsibilities as Canadian citizens to participate fully in the democratic life of Canada and to understand and uphold Canadian values. Below you will find resources that deal with these topics. The resources on this page were hand-picked by the Centre for Public Legal Education Alberta's staff as a good place to start. Not sure where to begin finding answers to your questions. Get started with our suggested resources. See additional resources below for more information. These FAQs are provided by the Canadian Legal FAQs, a website of the Centre for Public Legal Education Alberta. They provide answers to questions about the Charter of Rights and Freedoms. The Alberta Civil Liberties Research Centre is a Canadian non-governmental, non-profit organization affiliated with the University of Calgary which undertakes research on contemporary civil liberties and human rights issues that are of concern to Albertans. The projects are diverse - from proposals for reform of human rights legislation, to a report on citizen complaints about police conduct, to a manual for lawyers who represent mentally disabled clients. Staff and volunteers make presentations on a wide range of civil liberties and human rights topics. The Alberta Human Rights Act establishes the Alberta Human Rights Commission to carry out functions under the act. The Commission is an independent commission created by the Government of Alberta, which reports to the Minister of Culture and Community Spirit. The Commission has a two-fold mandate: to foster equality and to reduce discrimination. It fulfills this mandate through public education and community initiatives, through the resolution and settlement of complaints of discrimination, and through human rights tribunal and court hearings. Human rights in Alberta is a newspaper-style publication that provides plain language information about Alberta's human rights law and about the services offered by the Alberta Human Rights Commission. The publication has teaching notes to with it and is particularly useful to adults who are improving their English reading skills such as English-as-a-second-language students or literacy students. This resource is available as a printable PDF and also in an audio version. If you’re planning to demonstrate, be safe, be careful, and know your rights. Download a 1-page pdf prepared by the Canadian Civil Liberties Association that outlines your rights and responsibilities at protests in Canada. This report prepared by the Alberta Civil Liberties Research Centre discusses the rights of adults (persons who are 18 years or older) who have been accused or convicted of crimes and are either being held in custody in Alberta jails or correctional institutions or being supervised in the community by correctional authorities (for example, those released on bail, parole or other forms of conditional release). The CCLA fights for the civil liberties, human rights, and democratic freedoms of all people across Canada. Founded in 1964, they are an independent, national, nongovernmental organization, working in the courts, before legislative committees, in the classrooms, and in the streets, protecting the rights and freedoms cherished by Canadians and entrenched in our Constitution. The Commission's business is to make the Canadian Human Rights Act work for the benefit of all Canadians. 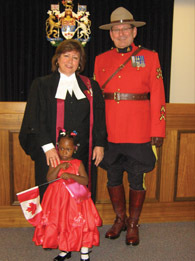 There are three main aspects to its work: To provide effective and timely means for resolving individual complaints; To promote knowledge of human rights in Canada and to encourage people to follow principles of equality; and to help reduce barriers to equality in employment and access to services. Their website includes sections with publications and frequently asked questions.The Commission provides dispute resolution services in cases of alleged discrimination by federally regulated organizations, including employers, unions and service providers. This online resource addresses issues such as alternative dispute resolution and the dispute resolution process. Created by the BC Civil Liberties Association, the overall theme of The Citizenship Handbook is citizenship, and its rights and responsiblities. It is hoped to encourage citizens - both individually and in groups - to become more involved in the democratic life of their communities. This resource is provided by Canadian Legal FAQs, a website of the Centre for Public Legal Education Alberta. It explains the areas of responsibility of the different levels of government in Canada. These FAQs are provided by the Canadian Legal FAQs, a website of the Centre for Public Legal Education Alberta. These FAQs provide information about constitutionally-protected French-language minority rights outside of Québec and are divided into 5 sections: General Information; Education Rights; Rights Regarding Government Services and Communications; Rights Regarding Access to Legislation and Government Publications; and Judicial Rights. This site is part of a funded project to assist teachers, students, scholars or any activists who wish to promote equity and the acceptance of differences within schools and communities. This site offers a variety of on-line resources, funding sources, glossaries, examples of projects, and selected readings to help you get started. This series of handbooks are produced by the Canadian Association of Elizabeth Fry Societies (CAEFS). They explain the rights women have while in prison, (federal and provincial) and while out on conditional release, and discusses some of the ways women prisoners can exercise their rights and avoid having them restricted further. Another purpose of the handbooks is to aid in the training of prisoner advocates inside and outside prison. Handbooks for women in provincial jails are available for New Brunswick, Ontario, Quebec, British Columbia, Saskatchewan. The handbooks are also available in French. LawNow is a bi-monthly digital public legal education magazine which has been published by the Centre for Public Legal Education Alberta for almost 40 years. Its articles and columns are written in plain language take a practical look at how the law relates to the every day lives of Canadians. In each issue, LawNow’s human rights column takes a look at a specific topic in this area of law and explains it clearly and concisely. The John Humphrey Centre for Peace and Human Rights is a non-profit human rights organization located in Edmonton, Alberta, dedicated to human rights education. Named after the late John Peters Humphrey, the principal drafter of the United Nation Declaration of Human Rights, the Centre’s mission is to advance the universal implementation of human rights through teaching and education of all people, with a specific focus on children and youth. This guide, produced by the Civil Liberties Association of BC, outlines some basic ideas and concepts concerning civil liberties for students. It can however be used by anyone who is interested in civil liberties, including parents, guardians, teachers and school staff. Knowledge is power: if you know what rights are and how they work, you can better understand and protect your rights, and protect and respect the rights of others. Talk Rights is a new online space for the Canadian public to learn about their rights and freedoms. Explore their collection of resources, and contribute your own ideas, stories and priorities to the conversation. Teachers check out their resources for elementary and secondary students. This online resource is published by the Human Rights Program of the Department of Canadian Heritage. Its aims are to increase understanding of the Canadian Charter of Rights and Freedoms and to heighten awareness of its importance in our daily lives. This website provides general legal information only. It does not provide legal or professional advice. See our Disclaimer for more information. Copyright 2015 Legal Resource Centre Alberta.